Today I wanted to share some of the wonderful creativity of our readers! I love getting letters & pictures of your projects, so if you have something to share… please take a minute & send it in! 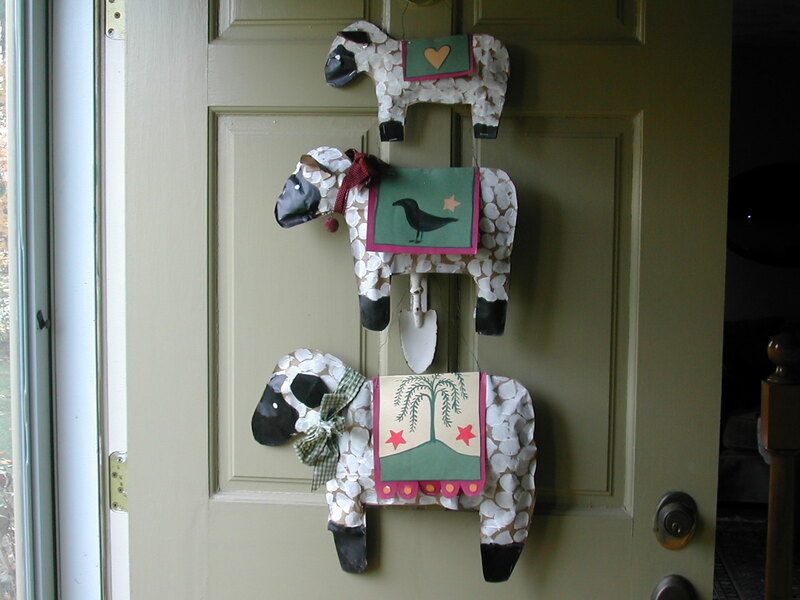 Ingrid sent in a note to let me know that a picture of my little “prim” sheep included in a post about decorating for Autumn inspired her to make her own “paper” version of the 3 sheep to hang on her front door. 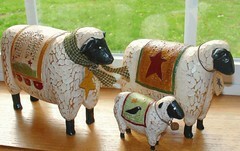 Here are our 3 little sheep, which were given to us by some friends. Here’s Ingrid’s letter & a picture of her creative project. I love your site. I really like your design and decorating style, especially the idea of using what you have! Right on sister. I posted about you on my own blog today, because you inspired me. 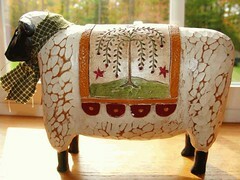 I had come across your sheep on another blog, they inspired me to make my own version, take a peek! Shelley stopped by and left me a message after I posted the article about making cinnamon & applesauce ornaments. You probably remember me saying that the ornaments could be used anytime of the year – especially for Valentine’s Day. Well, here’s Shelly’s note & a picture of her beautiful creations! Thank you for your wonderful blog. I don’t know how many times I looked at your Christmas decoration pictures. They are inspirational. I had been meaning to make the cinnamon applesauce ornaments before Christmas, but it never happened. My daughter (12) and I made heart ornaments today for Valentines Day. What fun! We had to remind her brothers several times not to eat them (we added a bit of Elmer’s glue to the recipe). The smell is wonderful. Every year she and I host a Valentine’s Day Tea for her Girl Scout friends, and we always have a little treasure bag for each girl to take. This year the cinnamon ornaments will be a lovely addition! I also wanted to tell you that I found a lovely Christmas quilt (I had been sighing over the one you put over your table) at an after Christmas sale for only $7. I could not believe my luck! It is so gorgeous – and worth the unplanned trip to the mall my teenage daughter begged for. Thanks again for your blog. It helped me through the long season with five kids. Here are the cinnamon & applesauce decorations that Shelley & her daughter made. 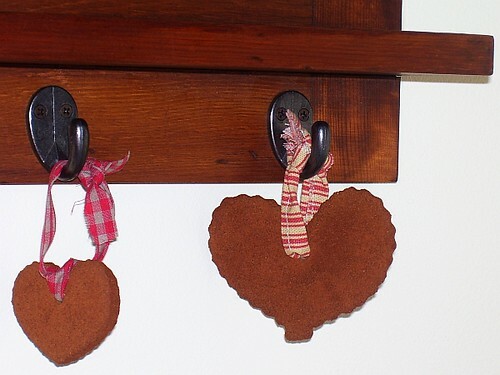 I love, love, love the cinnamon and applesauce ornament idea for Valentine’s Day! 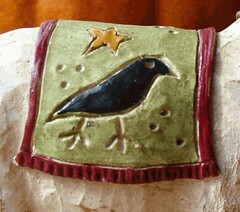 I am going to try and make a bunch of these and string them together as a garland. Thanks for the inspiration! How cute! Your readers have inpsired me. Thanks for all the lovely ideas. 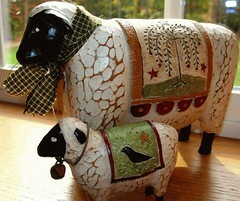 Oh, I love the sheep! And…the cinnamon ornaments are a perfect touch to Valentine’s Day!